Washington, DC – Today, the U.S. House passed (H.R. 8), the “Water Resources Development Act (WRDA) of 2018” – which provides for improvements to America’s ports, inland waterways, locks, dams, flood protection, ecosystem restoration, and other water resources. The measure was unanimously approved by the Transportation and Infrastructure Committee last month, and easily cleared the full House today with a vote of 408 – 2. The legislation includes a critical increase in the authorized cost of the Savannah Harbor Expansion Project (SHEP) to ensure the completion of Georgia’s top economic priority remains on schedule. Rep. Rob Woodall (GA 07) supported the bill’s passage today while ushering it through the Committee process and full House vote. Hear more from Rep. Woodall on the Georgia impact here. It is true that Georgia has been a leading investor in the project since it began, and it is also true that in recent years, WRDA has often been the mechanism of choice for Florida and Alabama’s efforts to influence the tri-state water negotiations. Congressman Woodall again led the charge to ensure that no such language was included, and succeeded in keeping Washington politics out of Georgia’s water rights – in particular, Forsyth County’s own Lake Lanier. With the positive economic impact remaining front and center for many Georgians, supporters of H.R. 8 range from local business owners to Governor Deal. Lisa Winton, President and co-owner of Winton Machine in Suwanee, is one of those business owners. Previously, following WRDA’s approval by the Transportation and Infrastructure Committee on which Rep. Woodall serves, Governor Deal voiced support for the bill as well. In Georgia, port-supported jobs total more than an estimated 439,000, with over 25,000 of those being found in Gwinnett County, and over 4,500 in Forsyth – the two counties comprising the Seventh District represented by Woodall. Personal income across the State derived from these positions surpassed $25 billion last year alone (FY2017). 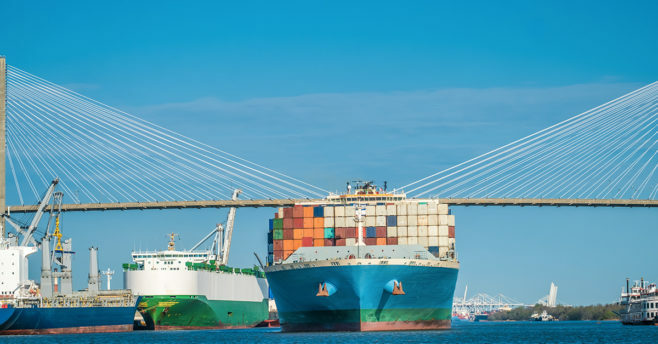 As the nation’s fastest growing and fourth-busiest container port, the Port of Savannah handles more than 3 million twenty-foot equivalent container units per year for more than 21,000 U.S. businesses. It is also the largest single-terminal container facility of its kind in North America.